Just like Reagan after he left office. He went to Japan to talk about whatever and made millions. I don't see someone like Bush Junior ever doing any work for Habitat for Humanity or anything like that. It's fitting that he's going to Alberta, which is sometimes called the Texas of Canada. As for most of us down here, we've heard more than enough from him to last a lifetime. larry he will be speaking to an empty house. I can't wait to read his book. I am sure the canadians will welcome his presence! You think Bush was bad do you, wait til the end of Obama's term and see were he stands. When people realize he can't fix the economy, they will turn on him like a pack of hipocritical wolves that they are! Where is he going to learn English prior he embark on this venture. Did Bush and Palin go to the same schools. Their lack to communicate then blame others for their mistakes is almost they have to be relatives or school buddies. Both of them please go away. HOW CAN THE INTELLIGENTSIA OF AMERICA BE SO BLINDED that they cannot see that the Federal Government must have a money system that can create and maintain an equivalent ratio of money to the goods and services that its peoples’ hands and minds can produce? Nature’s Basic Law of Economics states: All goods and services flow from the action of people resources on natural resources— Money is the medium of exchange which should be equal to the value of the goods and services—and not to a gold standard or some other insane idea. RECESSION is a product of the blatant ignorance of the President, Congress, Economists, and the News Media who do not understand Nature's Basic Law of Economics, and Article 1, Section 8, of the Constitution. Nature’s Basic Law of Economics states: All goods and services flow from the action of people resources on natural resources— Money is the medium of exchange which should be equal to the value of the goods and services—and not to a gold standard or some other insane idea. Mr. President, we need to help the governors of each state balance their budgets. They do not have the Constitutional power to create money like the Federal Government does (article 1, section 8, of the Constitution). You will save a lot of jobs and fuel the economy more by this than by giving money to the banks. The Federal Government has the responsibility to make sure there is enough money so every entity can have a balanced budget. MR. PRESIDENT, now that you have the stimulus –ask businesses to do their part by lowering all their prices by at least 1%. Stop the negative talk. Keep encouraging people to start buying and spending. Give each state one billion dollars for each member of Congress– which would distribute the money equally among the states. States could keep all of their employees, and they could add a few more. They could create millions of new jobs by getting a lot of needed projects going. The Federal Government has the Constitutional authority to create new money. It doesn’t need to borrow it from China or anyone else. Giving 535 billion dollars to the states makes more sense than giving two or three trillion dollars to the banks. TAX CUTS FOR THE RICH AND FLOAT DRIED UP MONEY SUPPLY When the rich get tax cuts, they don’t put it under their mattress; but what they do with it has the same effect. They store it as bytes on computer chips. They don’t spend the money that’s needed to moves goods and services. The efficiency of the clearing houses for financial institutions has dried up trillions of dollars in float. You can’t beat a check to the bank any more. Debit cards, paying bills on line, buying on the internet with Pay Pal and the many other ways that money can instantly be taken out of bank accounts has dried up the money supply. When you could beat a local check to the bank and when it took an out of town check ten days to clear the bank, there were billions of dollars that could be spent by the depositors and billions that could be loaned out by the banks. WHERE ARE THE ECONOMISTS? internetfreepress.com. All of the economist are down in the same barn shoveling in the same pile of cow manure. Please help get these dumbells on the right track. What is he going to be talking about other than he lied about going into Iraq and it was party time while he was in office. Will he say he bought the election in 2000 and used the Fear card in 2004? Will he say how he promised to help the big 3 bailout then hurried off that weekend instead to have a pair of shoes thrown at him? Will he say that as our Country was getting worse we had a President by the name of Bush who acted like he was already retired in the locker room with a towel over his shoulder while one that had his hands tied till Jan 09 that had to sit seeing our Country going deeper and deeper? Will he say how Cheney gave himself more power than any other VP? What about Cheney who just had to carry those certain boxes that a mover or aids who do help weren't to carry when he pulled his back out. What honest issue could he actually talk about? Calgary,not all that far from here is the Texas of Canada,and Bush has some oil ideas they probably want. The stimulus hype and change remains to be seen. 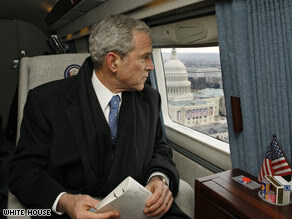 Bush did the best he thought at the time and dealt with alot of problems as de regulation from the previous president. When obama's plan falls apart,because this is not a u.s. only problem,Bush will not look that bad.Especially more war. At least there was no more attacks. The u.s banks are cutting credit,not expanding it. That will not change and the economy will keep dropping. It's easy to be critical on someone who congress, house, or senate never tried to work with. A president can't do a whole lot or make a lot of positive changes when the democrats are working against someone. The world trade centers got knocked down his first year in office and killed our finnancial institution. You want to blame someone for the economy, blame the arabs that sent the people over here in our country to bring it down. There has not been another attack on this soil again since that, and I thank our soldiers and president Bush's stance on defending our nation. At least he had the balls to stand up to the enemies, while the democrats were ready to crawl into a shell and hide from them!! President Bush did extremely well with the hand he was dealt coming into office. He must have done a really good job or people would not have elected him TWICE!! But anyway, talk bad about Bush all you want, we'll see how our super hero who's gonna save us all stands at the end of his term. He'll make Bush look like an angel. does he really need the extra money ? or just misses giving speeches ?